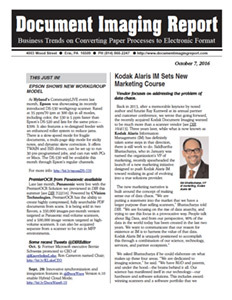 Like most printer/multifunction (MFP) vendors, Konica Minolta is continuing to diversify its business to add more document-related solutions and services to its mix. The latest move is Konica Minolta Business Solutions U.S.A.’s acquisition of Fulton, MD-based reseller and service bureau Quality Associates, Inc. (QAI), along with QAI’s wholly owned SharePoint-focused subsidiary DocPoint Solutions. QAI is a leading Kofax reseller, especially in the federal government market, and Konica Minolta is a Diamond Kofax partner globally. In 2014, QAI was awarded a GPO 951-M Contract by U.S. Government Publishing Office, which Konica Minolta will be able to leverage to sell ECM solutions and SharePoint services into the federal government. DocPoint adds to a Microsoft SharePoint integration practice that Konica Minolta has been building with the help of two acquisitions—Hershey Technologies last year [see DIR 8/14/15] and Cold Cypress in 2011. QAI’s service bureau business is complementary to the service bureau Konica Minolta acquired with AMS Imaging in 2014. QAI/DocPoint represents the latest of several ECMfocused services businesses that Konica Minolta has acquired over the past few years. “This is our largest ECM-related acquisition in terms of people and revenue,” said Sam Errigo, Executive Vice President, Sales and Business Development, Konica Minolta. “We did a lot of research on QAI and DocPoint; it is a highly respected organization with an unbelievable practice focusing on Kofax and SharePoint, and the service bureau fits very well with AMS’s service bureau located in the Northeast. “In addition, we did two acquisitions earlier this year for our core business [MFP and MPS sales] in the Baltimore/Washington area, which greatly expanded our sales coverage in the region. The QAI/DocPoint acquisition is strategic to our overall transformation strategy and will accelerate sales of ECM and BPO services into our customer base,” Errigo said. QAI Executive Director and DocPoint President Scott Swidersky couldn’t have sounded happier that the deal had closed. “This is something we have been working on for the better part of 16 months,” he told DIR. “We feel it’s a real home run for our employees and customers. “Our company has grown organically since it was founded more than 30 years ago, but we reached the point where we felt we had to consider an expansion strategy to keep pace with market demands. We had to consider a direction that was best for our company, employees, and customers. We had a number of conversations with venture capitalists, but we didn’t feel that direction made sense because of the way they would manage the company going forward. Swidersky wanted to make it clear that QAI was not under pressure to sell. “Because there is so much consolidation in the industry, and some of it involves companies moving in the wrong direction, people have been asking me, ‘is this a distressed sale?’ The answer is no. We were well valued by Konica Minolta, and they met all our terms and expectations. Their interest in us was as a strategic buyer that wanted to take our talent and resources and enable them to move forward. Konica Minolta is not finished growing its ECM footprint. “We are going to continue to buy in the ECM services space; we will focus on companies that specialize in Hyland OnBase, SharePoint, and Kofax,” said Errigo. “We will also continue to expand our BPO services in select markets to increase our coverage model. In the south, for example, we have an existing sales operation that we are looking to expand through acquisitions. It would be a bonus if the companies we buy have BPO services.